The north side of the airport encompassed several rows of T‐Hangars. Buildings J‐4 and J‐5 were “portable”, Port‐a‐Port, hangars and were in severe disrepair. The airport authority desired to remove these buildings and replace them with new, pre‐engineered metal building construction matching the other permanent buildings on either side. The clear door width for the set of buildings was 41.5’ x 12’. Each building is a standard (stacked) configuration consisting of 14 units (28 total). Taxilane widths and clearance between buildings were designed for the maximum wingspan that the hangar units can accommodate with a factor of safety to allow for a manufacturer with a wider building than the existing structures. Also included in this project were 2 larger hangar buildings to the south of Taxiway F. These hangars were designated as J‐7 and J‐8. Taxilane and drainage infrastructure were already in place through a past project designed by ICE staff. The clear door width for these buildings will be wider than J‐4 and J‐5 at 47.5’ x 14’. Special, larger end units were designed on each of the two buildings with a clear door width of 51’x16’. At this width, J-7 can accommodate 12 units and J‐8 accommodated 15, both with a nested configuration. The offset from the centerline of the taxilane will accommodate all ADG I aircraft. 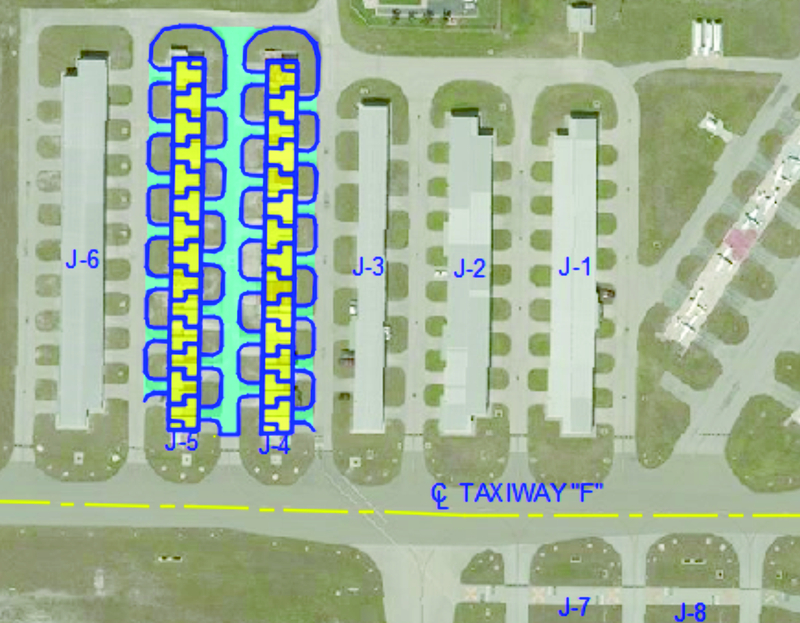 Site work will consist of the removal of the asphalt pads under the Port‐a‐Port buildings and a removal and relocation of the taxilanes to line up with the new doors. Taxilane J‐5 between the two north units was removed and replaced to provide for adequate drainage and to ease efforts in pushing the aircraft back into the hangar. Here, the site drainage and pipes were reconfigured to accommodate the new layout and grades. An extension of the water line was required for the addition of two fire hydrants. No gutters were included. Instead, a larger concrete foundation or a pad was constructed outside the perimeter of the building to limit erosion. Ridge vents were provided for air circulation. Exterior building mounted LED lights were provided for taxilane illumination. Door types were bifold type. Building manufacturer was Erect-a-Tube. The project was funded through a 50/50 grant from FDOT.